. . . one of the most sought-after violinists . . .
[Brahms]: Batiashvili maintains a firm line and a sweetly singing tone throughout, again coaxing from Thielemann and the Staatskapelle Dresden an intimate veil of sound, expressive and dreamily impassioned . . . . Batiashvili manages to impress her own stamp upon a performance that balances the intimate gesture with the heroic impulse.
. . . the artist delivers a Brahms Violin Concerto of great distinction. Hers is a forceful, direct reading defined more by refinement than size.
. . . this performance is lively and warm, partly thanks to Batiashvili [the concerto's electrifying soloist on this CD], who sets the dominant tone in her darkly sensuous opening line . . . throughout Batiashvili remains herself: less showy than some but deeply responsive to the music's inner workings and its colours. The range of hues summoned within her long phrasings is wondrously wide, each one delicately applied. The slow movement, the concerto's singing heart, is tender without being sentimental. And Batiashvili and Thielemann jointly triumph in the first movement's chief necessity -- keeping the scale epic and muscular while maintaining an intimate focus. Here is the sort of thoughtful reading that makes you fall in love with the concerto all over again . . . [in Clara Schumann's fetching violin and piano "Romances"] Batiashvili is brightly partnered by Alice Sara Ott.
. . . there is a tensile quality throughout. Speeds are well judged and the Dresden band play winningly. It was a brilliant idea to fill the disc with the Three Romances, Op 22 . . . Lush and poignant, they make one regret that Clara's career as a composer became subordinate to her husband's.
. . . very beautiful it sounds . . . The concerto is engrossingly done, with the first movement majestically shaped and the finale sensibly paced so that we appreciate its logic as well as her panache. And she does indeed play the Adagio like a declaration of love.
. . . an exceptionally sweet-toned sound she makes with it.
. . . a wide-ranging violinist . . . I don't think I have ever heard a performance of this concerto in which the orchestra figured like this. You listen to the opening bars and you notice the bassoons and the horns. From that point onward you're attending to the orchestra, and noticing details that were always there, but that you'd never paid attention to, because . . . well, a concerto is all about the solo part, right? Not so . . . . [Batiashvili] is a positive tiger in places. But she's willing to cede the spotlight, or at least share it. As a result, I found myself hearing things I hadn't noticed before: dialogues between soloist and woodwinds, or between soloist and strings, interactions that were scarcely there in performances where the soloist was it and the orchestra was at best a decorous backdrop. As you'll have gathered, part of this is simply balance. Batiashvili is enmeshed with the orchestra much more than most Brahms Concerto soloists are. You can hear very well everything else going on around her, and often the accompanying solo winds match her strength, while the brass are frankly beyond it. Yet the real genius of this performance is in putting this violinist, this orchestra, and this conductor together in the same hall. Batiashvili is a slender-toned sort of violinist . . . the silvery thread of sound is one of her specialties . . . As for Thielemann, I credit the balance to him, and it's brilliant. Batiashvili plays Ferruccio Busoni's cadenza in the first movement . . . and in this recording it's, I'd say, deliberately audible. The cadenza is wonderful . . . The slow movement is very fine . . . The finale has that slight rhythmic stickiness that belongs to Magyar music. It struts a bit, as it should. But then you hit that solo passage near the end, and suddenly you are, for a few bars, in solo Bach territory, sweetly and gently played. It gets a lot more raucous after that, but Batiashvili's deceleration in the final bars is the most elegant I've ever heard. She nearly evaporates before the orchestra caps her. The coupling is Clara Schumann's Op. 22 Three Romances for violin and piano, with Alice Sara Ott. I may say that this performance makes me want to go out and buy a copy of them. They are very like her husband's short instrumental pieces . . . I'm glad to have them, especially played this well.
. . . impeccable technique and sense of timing . . . in the opening tutti the orchestra sits well in the hall, with a natural sense of perspective . . . a beautifully played oboe solo [in the second movement] . . . [her quieter playing] allows her seamless legato and tonal sophistication to shine. It's a welcome surprise to hear the Busoni cadenza in the first movement . . . [C. Schumann' Romances are] satisfying . . . Even before Lisa Batiashvili makes her entrance, we can sense this will be an outstanding performance of the Brahms. Finely balanced, spacious recording, with woodwind and horns well placed, highlights the fine orchestral playing -- solo lines projected but with the whole beautifully blended. And Christian Thielemann, in the first movement maintains the momentum of a true Allegro while giving the lyrical lines room to expand. Lisa Batiashvili, too, finds a wholly convincing equilibrium between her bold, passionate entry and the more reflective music that follows . . . In the finale, Batiashvili and Thielemann maintain a springy, joyful rhythmic impetus throughout . . . Batiashvili is forceful whenever she needs to be, while proving adept in finding moments of delicacy and playfulness. Batiashvili and Alice Sara Ott are splendid advocates for the Clara Schumann Romances bringing out all the changes in mood and character of these highly accomplished pieces . . . This is an outstanding performance of one of the most challenging concertos in the violin repertoire. Georgian violinist Lisa Batiashvili adopts decent tempi, instead of the sluggish speeds so many of her rivals favour: The work glows as a result. Eine wunderbar tonschön ausgesungene Einspielung des Violinkonzerts von Brahms, in der Lisa Batiashvili mit Busonis Kadenz einen individuellen Akzent setzt, und Christian Thielemann mit einer dynamischen Profilierung des Orchesterparts aufhorchen lässt. Dazu gibt es noch Clara Schumanns Romanzen op. 22 als liebenswerte kammermusikalische Zugabe. 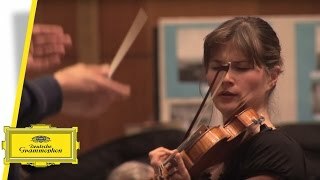 Eine Liebeserklärung an das Violinkonzert von Johannes Brahms ist die Einspielung . . . genau erfüllt sie die Vorgaben der Komponisten und arbeitet die Nuancen mit großem Einfühlungsvermögen zu einer klaren, kraftvollen Fassung heraus. Batiashvilis Ton schwankt zwischen leidenschaftlichem Feuerwerk und sehnsuchtsvoller Klage, dabei trifft er stets eine angemessene Intensität. Vor allem am Ende des ersten Konzertsatzes legt sie die ganze Bandbreite dieser Gefühlswelt in einige wenige Takte, die ihre Könnerschaft und ihr tiefes Verständnis für dieses Werk offenbaren . . . [C. Schumann: 3 Romanzen]: Dass diese Stücke nicht zu einem technischen Geprotze verkommen, verhindert das vorausschauende, aufeinander abgestimmte Spiel der beiden Musikerinnen, indem sie zum Beispiel der Romanze Nr. 3 in B-Dur mit der Vorgabe "leidenschaftlich schnell" eine fast zärtliche Note verleihen. Die drei Romanzen von Clara Schumann sind romantische Miniaturen, die von Wärme und Zartheit durchdrungen sind -- und vor allem von Liebe. Bathiasvili und die Pianistin Alice Sara Ott fühlen sich tief ein in diese Gefühlswelt . . . Zerrissenheit und Melancholie -- das sind Ebenen, die Batiashvili im Violinkonzert von Johannes Brahms entdeckt. Bei ihr wird der Komponist greifbar, sie beleuchtet in der Musik seine ganz unterschiedlichen Seiten und Facetten. Ein echter Hinhörer ist die virtuos gespielte Kadenz aus der Feder Ferruccio Busonis mit der Pauke als Begleitung . . . Der traumhafte zweite Satz des Brahms-Konzerts ist ein Höhepunkt der CD. Batiashvili singt hier wirklich auf ihrem Instrument, spannt die Linien weit aus und traut sich dynamische Extreme zu -- manchmal bis zum fast unhörbaren Piano. Wunderbar getragen wird sie dabei von der Staatskapelle Dresden unter Christian Thielemann, mit dem sie ein angenehm fließendes Tempo findet. Batiashvili ist eine Weltklasse-Geigerin -- das beweist sie mit dieser Aufnahme aufs Neue. Ihrem Instrument entlockt sie genau den strahlenden, warmen Ton, den diese Musik braucht.
. . . [eine] beherzt aufspielende georgische Geigerin Lisa Batiashvili . . . mit der Staatskapelle Dresden unter Christian Thielemann . . . sehr gut . . . [C. Schumann]: am Klavier sitzt keine Geringere als Alice Sara Ott, wenn man will: der vierte Superstar auf der CD. Die beiden Damen musizieren höchst inspiriert und leidenschaftlich und schaffen es, einem diese unbekannten Stückchen von Roberts Frau beim ersten Mal Hören gleich nahezubringen. Sehr romantisch. Sehr lohnend. Erfrischend natürlich und mit faszinierender Leichtigkeit lässt Lisa Batiashvili ihre Geige bei Johannes Brahms' Violinkonzert fliegen. Alles wirkt mühelos und organisch. Hier hört man brillante Spieltechnik in Vollendung, die es erlaubt, den Geigenton schlank, sensibel, wandlungsfähig und gleichzeitig höchst expressiv zu führen. Die Geigerin entlockt ihrem Instrument einen wahren Klangzauber . . . Bei den leicht melancholisch verschatteten Drei Romanzen von Brahms' enger Freundin Clara Schumann für Violine und Klavier hat Lisa Batiashvili in Alice Sara Ott . . . eine Partnerin, die mit ihr am gleichen Strang zieht. Das Ergebnis: Kammermusikalische Preziosen vom Feinsten.
. . . drei hörenswerte Romanzen von Clara Schumann, für die [Lisa Batiashvili] nicht nur mit Alice Sara Ott pianistisch-weibliche Gleichgesinntheit, sondern über ihre Stradivari "ex Joachim" auch eine besonders inspirierende Authentizität gewinnt . . . Das Brahms-Konzert spielt Batiashvili blitzsauber, mit zupackender Geste und weiten Atembögen, für die sie ihren grandiosen Ton nach Herzenslust aufblühen lassen kann. Das hat Energie und Charisma, im langsamen Satz auch gespannte Intensität und in jedem Ton delikate Farben bis in die höchsten Höhen.
. . . warum die Georgierin aktuell zu den ersten Fachkräften an der Violine zählt, unterstreicht sie hier wie da. Schlank, aber nicht seelenlos ist ihr Spiel. Sie beherrscht das Sportliche, ohne dabei zu überdrehen. Und sie weiß dank ihres wohldosierten Vibratos genau zwischen echtem Sentiment und falscher Sentimentalität zu unterscheiden . . . Batiashvili [macht] im Brahms-Konzert somit mehr als nur eine Bella Figura . . . Wie zwei Musikerherzen im Gleichklang schlagen können, beweisen Lisa Batiashvili und Pianistin Alice Sara Ott in den innigen Romanzen . . . Spieltechnisch mögen sie Leichtgewichte sein. Mit welchem Einfühlungsvermögen aber Batiashvili und Ott aufeinander und auf die Musik eingehen, erweist sich als romantische Ausdrucksmusik mit Wonne-Garantie. Große Emotionen, raffinierte Klangwirkungen sind [Thielemann] wichtig. Aus ihnen formt er Interpretationen, die keinen Zuhörer unberührt lassen . . . Dass Thielemann Instrumentalisten ein ebenso aufmerksam zuhörender Partner ist wie Sängern, beweist die exzellente DG-Neuaufnahme des Brahms-Violinkonzerts mit Lisa Batiashvili. Sie spielt diese Musik einfach so überzeugend, als ob sie für sie komponiert wurde.
. . . la Géorgienne Lisa Batiashvili joue "le Brahms" avec un mélange d'autorité souveraine et de raffinement délicat que l'on ne rencontre que chez les plus grands. Le phrasé est libre mais souverain, le son d'une séduction infinie. Et pour couronner le tout, l'accompagnement (mais peut-on encore parler d'accompagnement lorsqu'il s'agit de Christian Thielemann et de la Staatskapelle de Dresde?) est d'une ampleur et d'une profondeur impressionnantes. Une version qui a toute sa place dans une discographie que l'on croyait saturée.
. . . conviction, talent et panache . . . un réel plaisir à entendre un "enregistrement de plus" de ce superbe concerto . . . Evident point fort de cette nouvelle version, la consistance et la cohérence de la vision du chef et de la soliste qui nous emmènent de la première à la dernière note sans nous faire changer d'oeuvre entre les mouvements, pas plus que dans le long premier mouvement qui garde ainsi toute sa force et sa cohésion. Le ton est volontiers vigoureux voire héroique, et malgré la puissance déployée, échappe à toute sensation de pesanteur . . . Autre point fort, le respect des proportions et des nuances, entre les passages puissants ou lyriques, mélodiques ou rythmiques, urgents ou détendus. Navigant sans hésitation entre ces différents climats musicaux, les interprètes réussissent à rester constamment expressifs et l'attention ne faiblit jamais. L'auditeur appréciera également la qualité des timbres du Stradivarius de Lisa Batiashvili . . . [la violoniste réussit] a donner une épaisseur charnelle au médium et au grave qui transmet une vibration intérieure qui ne manque pas d'intensité. Quant à la Staatskapelle saxonne elle est au niveau d'excellence où on l'attend, prenant toute sa part dans la réussite de cet enregistrement . . .